This advanced aorporate ainance assignment Brief consists of one piece of work divided into two parts. You should ensure that you answer all the sections. Beverages & Spirits Ltd (B&S Ltd) has been manufacturing beverages. In recent years B&S Ltd has noted that its costs have risen substantially and it is considering closing one or more of its food production plants. Projected annual future costs and revenues for each plant are as shown in Table 1.The projected costs and revenues are per unit. In all, B&S Ltd expects to sell 100,000 units of each beverage each year. Each factory lasts, in total, for five years and then becomes obsolete. The initial cost of each factory and the associated research and development costs for each beverage were as shown in Table 2 These were paid two years ago when production commenced. B&S Ltd must also pay a service charge on the factory, which is payable immediately if production at the factory continues. These are shown in Table 3. The service fee is not payable if production ends at the factory immediately; instead each factory could be sold for the amounts detailed in Table 3. These amounts will be realised only if production ends immediately. Note: Depreciation is charged on a straight line basis over the life of the project. Research and development expenditure is treated in the same way. Ignore taxation. 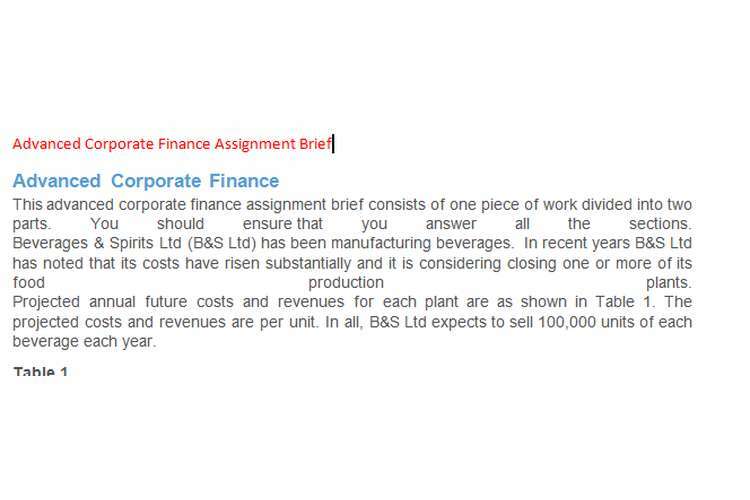 The estimated cost of capital for B&S Ltd is 13%. B&S Ltd has $180,000,000 invested in index linked gilts which provide an annual return of 4%. B&S Ltd usually applies NPV and IRR investment appraisal methods. It does not currently use payback. Discuss whether B&S Ltd should rationalise and end production in any of the factories producing the beverages.If so, suggest which factories should be closed and explain your answer fully. Explain what reservations you may have. If B&S Ltd faced a shortage of cash [e.g. Bank Haircut] and was able to meet service charges up to a total value of only $10,000,000, which factories would B&S Ltd decide to keep open? Discuss why the Internal Rate of Return method is used more often than NPV by financial directors. Your report should be grounded in relevant theory – use the core and recommended reading. Reference all sources appropriately, using the Harvard Referencing System. Use Times Roman pt 12, with 1½ or double spacing. The text should flow smoothly, with each section leading naturally and logically to the next.